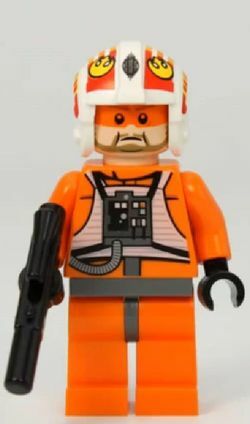 Jek Porkins is a Classic Star Wars themed minifigure released in 2012. The Porkins minifigure has orange legs with a grey hip joint, and also has an orange torso piece with black hands. The torso has black, white and grey printing on both the front and the back, depicting an orange flight suit with a white vest and grey harnesses. Additionally, on the front of the torso, a grey life support box is printed in the centre with a black area taking up approximately one third of the box, and several white and grey circles and buttons, with one orange button. A light grey tube is connected to the life support box. Porkins' head piece is flesh-coloured, with black eyes, downturned eyebrows, a black mouth shaped in a serious expression, and a brown beard. Black outlining is also used around the mouth area. An orange visor is also printed on, from the top of the printable area of the head to below the eyes. Porkins' helmet is the standard white piece used for Rebel pilots, but with a printing pattern reflecting Porkins' personalised design. This includes the use of black and grey printing, featuring red stripes and one yellow Alliance Starbird on each side outlined in black. As well as the helmet, Porkins has one other accessory, a black blaster. Jek Porkins was a pilot of the Rebel Alliance who flew with Red Squadron during the Battle of Yavin as Red Six. Porkins carried out strafing runs with other members of Red Squadron during the assault, but the squadron came under heavy fire from a nearby turbolaser stations. Porkins, along with Biggs Darklighter managed to destroy the tower, but some debris from the exploding tower hit Porkins' X-wing, causing his instruments to malfunction. These instruments began to generate false readings leading to Porkins flying too close to the Death Star's surface, making him an easy target for enemy fire. Upon discovering this, Darklighter told Porkins to eject, but he thought that he could handle the problem, however shortly after this exchange, Porkins was hit by a turbolaser, killing him and causing his X-wing to explode. This page was last edited on 9 January 2018, at 18:49.